Sometimes you have to force yourself to slow down. I don't know if any of you are in the same boat, but I have been pretty much running on all cylinders since the start of 2016 with work, blog, Houston restaurants, travel, social stuff, fitness, etc,. and it's all finally come to a head. SO. I am forcing myself to slow down. This might mean less food posts each week (mayyyybe). This might also mean less elaborate Houston dinners out, which are AWESOME of course, but sometimes? Low key is key.<~~I'm trademarking that. Jon and I found ourselves with a free Saturday night recently (one of those rare magical gems), and I didn't feel like cooking, but I didn't feel like having a fancy, lavish dinner, and he was on the same exact page. Jon is a big fan of the restaurant Ruggles Green. I had never been, and he's been wanting to get me there for a while, so we figured it was the perfect night for it! 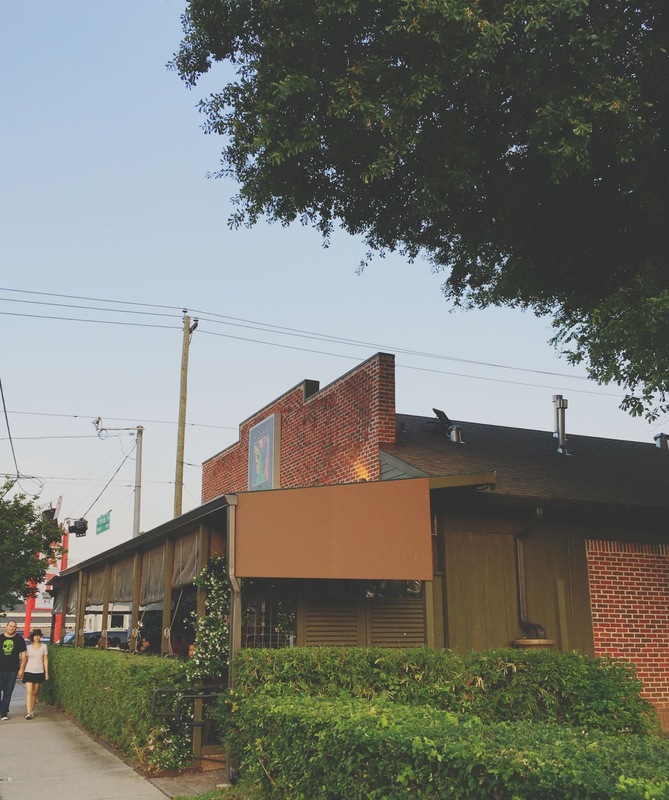 Since we live nearby, we ventured over to their Houston Heights location. The counter service restaurant has an open, airy interior. The food menu focuses on fresh, organic, local, healthy ingredients, and offers several gluten-free and vegan options. Jon and I decided to split the restaurant's organic spinach dip for our first round of food. 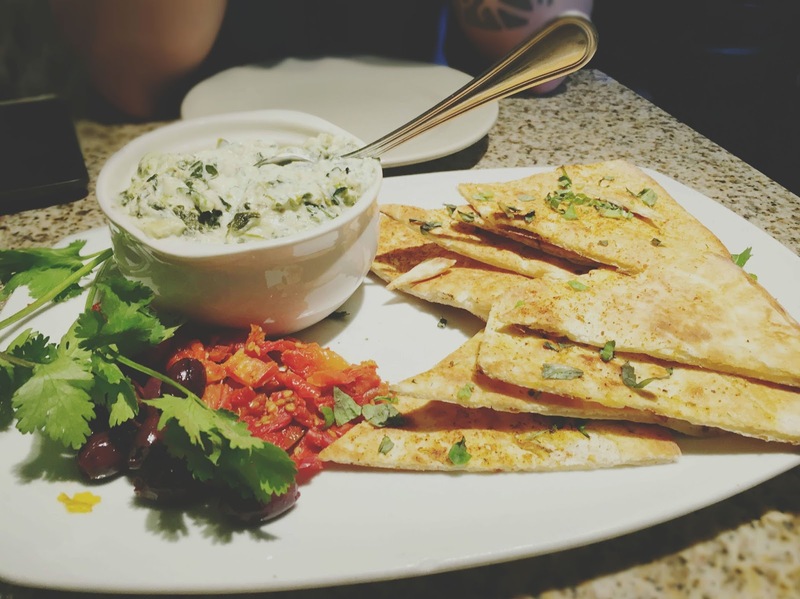 The dip is a blend of organic spinach, artichoke hearts, cream cheese, parmesan, goat cheese, white wine, and ricotta cheese, and it's served with a side of kalamata olives, sun-dried tomatoes, and wood-fired flat bread. This utra-rich dip was creamy and decadent, and the use of goat cheese was a very special element. I also loved the inclusion of sundried tomatoes and kalamata olives - Their acidity and tartness cut nicely through the dip and added fantastic textures. And the flatbread was crisp, fresh, and lovely. We really enjoyed this comforting, tasty appetizer! 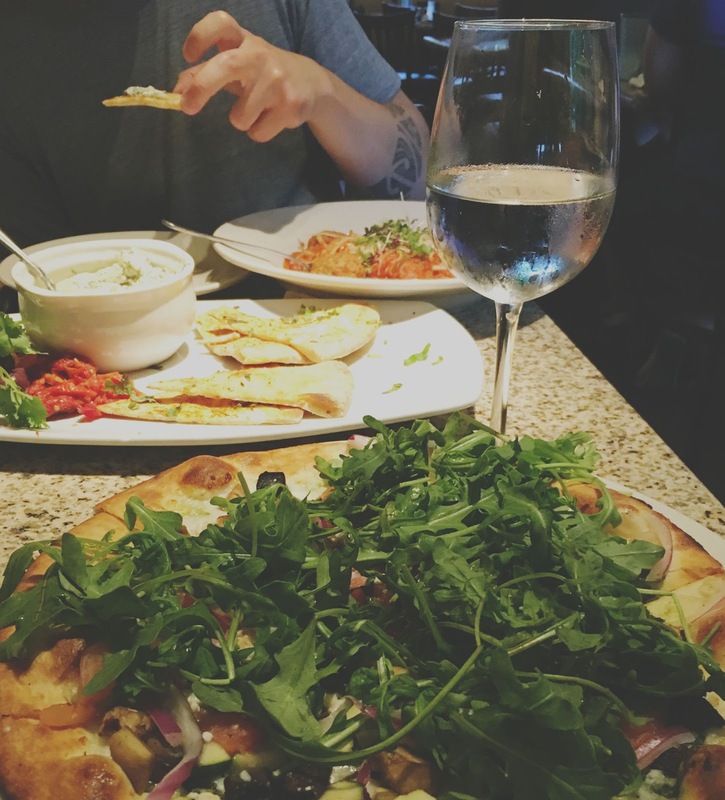 For our main course of food, I ordered the local veggies pizza, and Jon ordered his favorite from the restaurant - the quinoa linguini and and turkey meatballs. For the purpose of showing what was underneath all of the arugula (which was not overpowering, FYI), I moved it to the side in the photo above. 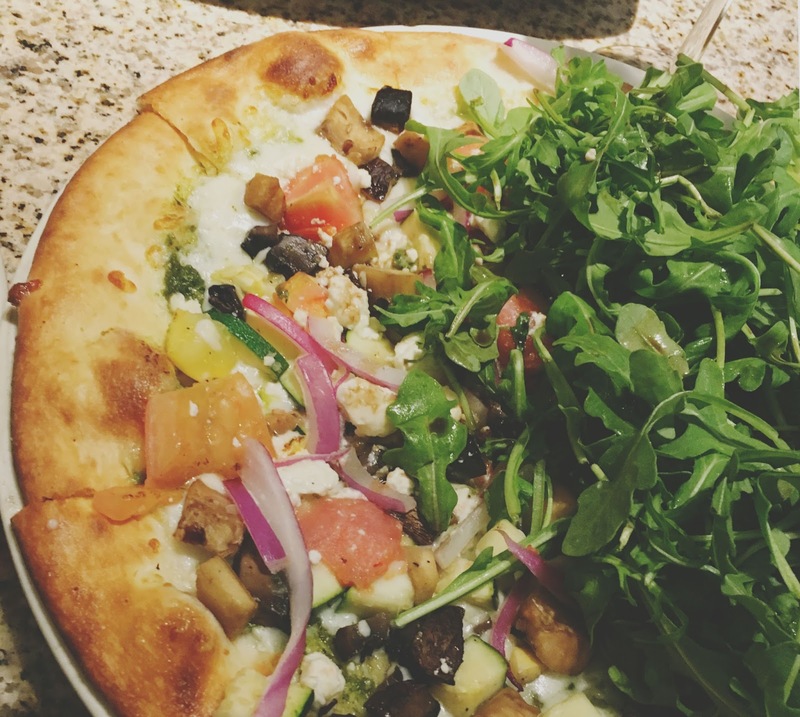 The wood-fired pizza was topped with roasted tomatoes, eggplant, zucchini, mushrooms, red onion, garlic, mozzarella, fontina, feta, pesto sauce, baby arugula, and balsamic vinegar. The crust was lightly crisped, yet thick and pillowy, the various vegetables were incredibly flavorful and complemented one another fantastically, the melty cheeses were subtle and gooey, and the balsamic vinegar added a wonderful hint of sweetness and brightness. I thoroughly enjoyed this pizza! 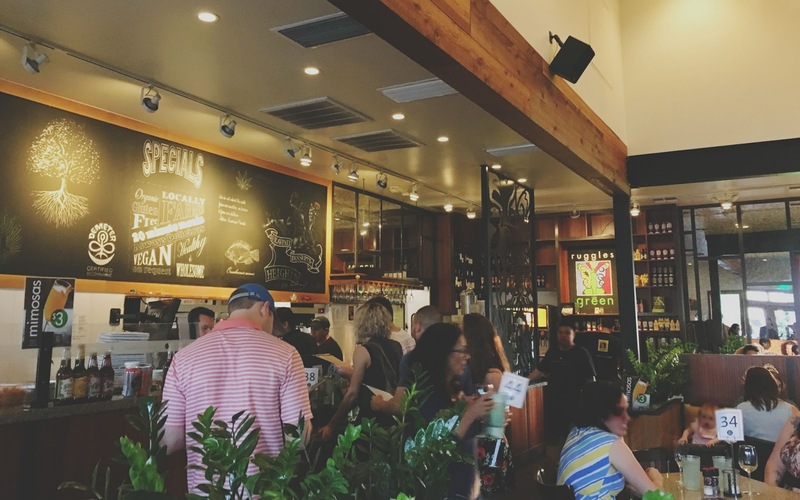 If you're wanting to grab a casual, yet thoughtfully made meal, Ruggles Green is the perfect Houston restaurant for that. The environment is laid-back and welcoming, and the food is fresh and nourishing. I'm a big fan!